MADISON, Wis. — Four players with double-figure kills and five players with double-figure digs propelled the Pepperdine women’s volleyball team to a 3-2 win in the NCAA first round against higher-seeded Northern Iowa, a team receiving votes in the AVCA Coaches Poll. The Waves posted 25-22, 25-21, 19-25, 20-25 and 15-13 set wins in a thrilling five-set match on Thursday night at UW Field House to advance to the NCAA second round for the ninth time in program history and first time since 2011. The Waves (22-8) were led by senior setter Blossom Sato, who dished out 57 assists and led her team to a .242 success rate on the attack with four players in double-figure kills, including Shannon Scully (22), Hannah Frohling (16), Heidi Dyer (13) and Tarah Wylie (11). Sato, Scully and Frohling also posted double-doubles during the match. After a two-set lead was compromised and UNI forced a fifth set, the Waves came out with a vengeance in the fifth. A 7-3 lead was stalled by a challenge call from the opposition that reversed a crucial point, swinging the momentum to the Panthers’ side of the court and allowing the competition to tie the score at nine-apiece. Each side exchanged points, with Pepperdine battling back from a one-point deficit at the 12-11 mark with kills from Scully and Frohling. After a 13-13 tied score in the final moments, Dyer and Scully posted a pair of consecutive smashes to earn the Waves a 15-13 set win and the overall five-set postseason victory. The Waves posted a .242 success rate on the attack with 72 kills and 26 errors on 190 swings. The Panthers also posted 190 attack attempts, marking 74 kills and 19 errors throughout the match, however, for a .289 clip. This is the first match of the 2018 season that the Waves won despite having a lower hitting percentage. The Waves led the court with seven aces and 82 digs, while the opposition had a match-high 10.0 blocks compared to the Waves’ 4.0. Each side of the court marked 70 assists. On the service line, the Waves marked seven aces to the Panthers’ two, along with 100 service receptions on a .980 serving percentage, compared to UNI’s 94 receptions on a .962 success rate on the back line. 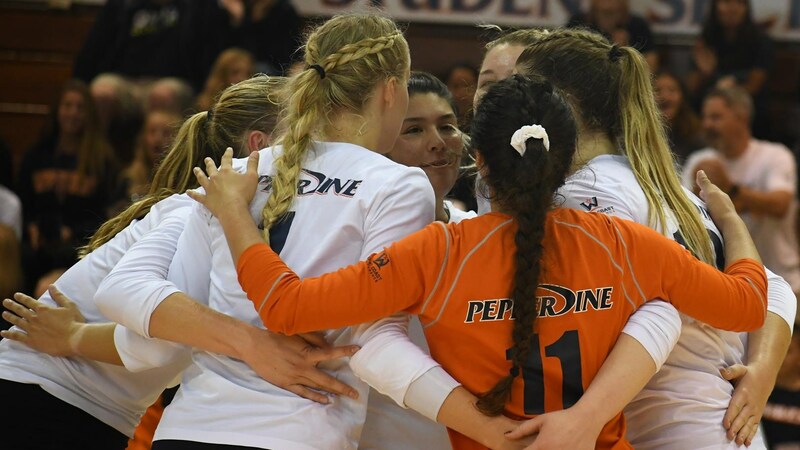 All-time, Pepperdine leads Northern Iowa 3-1, dating back to the 2000 season when Pepperdine won the first-ever match-up in straight-sets at home. This is second match the two squads have played on neutral courts with tonight’s resulting in the first Waves’ win. Shannon Scully has posted 14 double-doubles this season, leading the Waves, including her most recent today with 22-kills and 13-digs. She posted an impressive career-best output against Pacific on November 3, 2018 with 26-kills and 20-digs. Hannah Frohling has hit for double-figure kills in 18 matches this season and 58 throughout her career. Tonight’s double-double the 16th of her career. Frohling is currently at the 1,058 kill-mark in her career, surpassing the 1,000-career kill mark against Hawai’i in Malibu on November 6, 2018. Hana Lishman has put up 22 double-figure dig matches this season, with four above 20-digs including tonight’s match, and 69 in her career. Lishman has amassed 1,273 digs throughout her career thus far. She leads the Waves with 3.85 digs/set and 409 digs this season. Blossom Sato has led the Waves in assists in all but one match this season including a career-high 59 in the home opener against Idaho. She averages 10.84 assists/set. On the season, Alli O’Harra leads the Waves with 1.13 blocks/set after amassing 113 total blocks with nine solo rejections. Tarah Wylie has marked 91 total blocks, including 10 solo rejections for 0.85 blocks/set. Alli O’Harra had led the Waves in blocks for 17-consecutive matches at one point earlier this season, including seven of them with seven blocks or more. Despite falling behind to open the first set of the NCAA Tournament, the Waves did what they’ve done the past few weeks – battled back and persevered. Pepperdine fell behind by four at the 19-15 mark, but kills from Heidi Dyer and Shannon Scully and a big block from Scully and Tarah Wylie helped to close the gap to an even 20-20 tied score. Each side worked to a score of 22, but Pepperdine would close the set down with a kill from Alli O’Harra and a final pair of smashes from Hannah Frohling to win 25-22. Pepperdine took control of the second set and maintained throughout much of the action. After pulling ahead 13-7, the opposition started to close the gap and eventually tied the set at 19’s. Each side collected a point shortly after, but kills form Wylie and Frohling put the Waves at set-point and a final ‘Malibu Roofing Company’ collaboration from Scully and Wylie put the Waves ahead 2-0 with a 25-21 set win. The Waves also had five aces in the set to help the effort. UNI was the team to take the lead in the third set, pulling ahead by two early on and carrying it to an eventual 25-19 set win to force a fourth set. The Panthers broke out to a big start in the fourth set as well and despite a late comeback attempt from the Waves, were able to secure a 25-20 set win to extend the match to a fifth set. After a late momentum in the fourth set, the Waves continued en route to the fifth set victory to advance to the second round of the NCAA tournament. The Waves will face the winner of #6 Wisconsin vs. Green Bay on Friday night at UW Field House. The match will begin at 5 p.m. PT. MADISON, Wisconsin – The UNI volleyball team took on the Waves of Pepperdine University in the first round of the NCAA Tournament on Thursday, November 29, falling 3-2 with set scores of 22-25, 21-25, 25-19, 25-20, 13-15. The Panthers managed to lead the majority of the first set before slipping in the final points and dropping the set. The Panthers fell behind the Waves early in the second set, fighting back the Panthers tied the match at 19-19 but could not hold off a final run by the Waves and dropped the second 25-21. The Panthers took the third set in a dominant fashion, leading the majority of the set when senior Piper Thomas took over, recording a flawless set with six kills and no errors on nine total attacks. The Panthers rallied and took the set 25-19. The Panthers again dominated the fourth set, taking the set 25-20 to force the deciding fifth set. The Panthers trailed 8-4 at the court swap, the Panthers managed to tie the match 10-10 but fell in the final points 15-13. Junior Karlie Taylor played one of her best matches of the year, finishing with 23 kills, 13 digs, and four solo blocks for a team-leading 27 points. Jaydlin Seehase and Piper Thomas each had efficient nights with each recording 13 kills while Kate Busswitz finished with 11 kills on 26 attacks for a .308 attack percentage. The unsung hero of the match was freshman Inga Rotto who finished the night with 10 kills on 19 attacks. Rotto also recorded two block assists and a .421 attack percentage. Rachel Koop recorded 58 assists on 150 attempts and Kendyl Sorge ended the night with nine assists. Sorge and Baylee Petersen each finished with 21 digs while Taylor Hedges lead the Panthers in that category with 22 digs. The Panthers have finished the 2018 season with a 24-10 record. The Panthers were MVC Regular Season Co-Champions at 16-2 and MVC Tournament Champions. Three Panthers were named First Team All-MVC in Piper Thomas, Rachel Koop, and Karlie Taylor while Piper Thomas was named MVC Player of the Year. Kate Busswitz and Jaydlin Seehase each earned Second Team MVC honors. Three Panthers were named to the All-Tournament Team and the MVC Championships in Piper Thomas, Karlie Taylor and Kendyl Sorge with Piper Thomas being named Tournament MVP.